Monument Valley in Four Corners as seen here from the south side looking north, in this unusual field of view not seen by many people. In the immediate foreground lays the golden colored south end of Comb Ridge, a very odd monocline that runs for over 100 miles to the north and contains many Anasazi Cliff Dwelling ruins and pictographs. 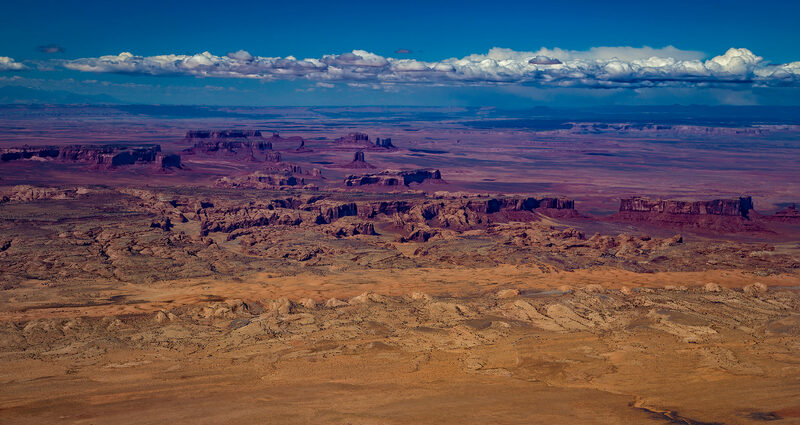 In the middle of the image, running horizontally with its slightly tinted purple hues, are the towering mesas of Monument Valley. Monument Valley (First Nations Navajo: Tsé Biiʼ Ndzisgaii, pronounced [tsʰépìːʔntsɪ̀skɑ̀ìː], meaning valley of the rocks) is a region of the Colorado Plateau characterized by a cluster of vast sandstone buttes, the largest reaching 1,000 ft (300 m) above the valley floor. Monument Valley, on the Arizona-Utah border, shaped public perception of the American West in John Ford films such as Stagecoach (1939) and The Searchers (1956), but the real story of the land is much older. Monument Valley is sacred ground. The Navajo have lived here for more than 500 years and their Pueblo Indian predecessors, the mysterious Anasazi, left remarkable records in the rock.